Hot music startup Spotify is holding a special event in New York City this morning, where it’s going to unveil what it’s calling a “New Direction” for the service. Spotify hasn’t given any details on what to expect, but it obviously considers it to be a very big deal — enough so that it’s invited dozens of reporters to attend. Several reports indicate that Spotify will be launching a new platform for third party developers, who will be able to integrate Spotify’s large catalog of music into new applications. Update: Yep, see below. As seems to be Spotify’s style, the event has unusually high production values: waiters are handing out espressos and bite-sized breakfast foods that I’ve never heard of (but are quite delicious). The company has a custom backdrop for the stage featuring music-themed illustrations. And there are over a dozen flat-panel televisions lining the walls, which I suspect will be used to showcase third-party apps later on in the event. The event is slated to begin at noon EST — I’ll be posting further updates as soon as things get started. 12:11 PM — The event will begin in five minutes. In the mean time, I was just offered a bite-sized cinnamon bun. It was flaky and very tasty. 12:15 — Okay, things are kicking off. 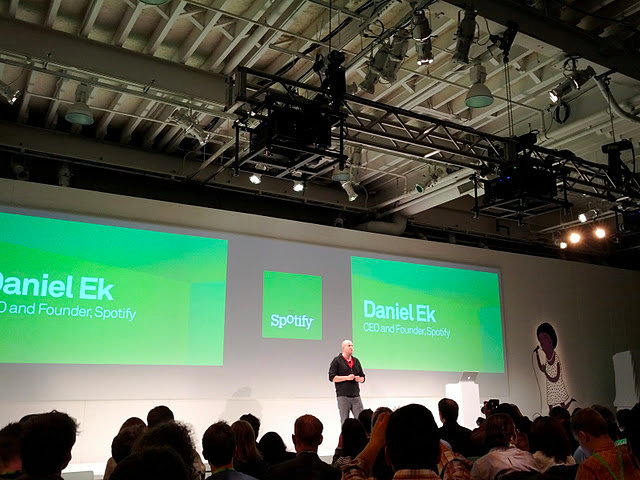 Spotify CEO Daniel Ek has taken the stage. “This is the first event like this that we’ve ever held.”. Going to talk about Background and mission as a company, the move into social, and finally, today’s announcement. Ek is walking through a brief history of digital music. ABBA’s ‘The Visitors’ was the first CD. Napster in 2000 introduced Ek to new bands (he didn’t have a lot of money at the time..). But it was illegal. And today, there are great legal services out there. But of the 500 million users listening to music online, the majority aren’t listening legally. “You need a better product than piracy”. All the music. Totally reliable. Fast and easy to share. Spotify has two payment options: free, with some ads, and premium, which has no as and lets you access Spotify from mobile devices. Spotify has 15 million songs, and is adding 20,000 tracks each day. Spotify is the second largest digital revenue source for labels in Europe after iTunes. And they’ve paid $150 million to labels so far. 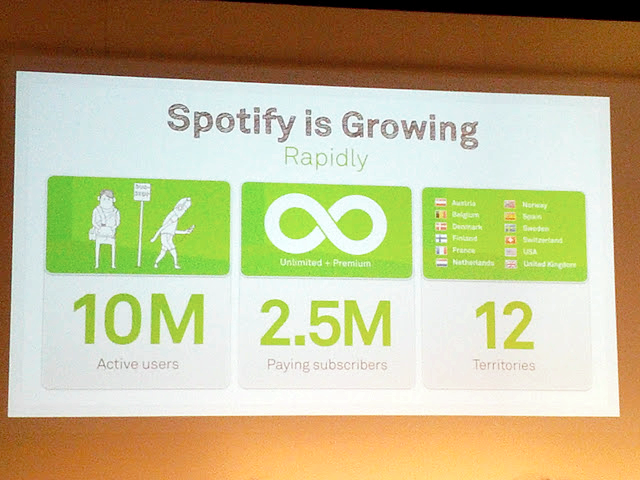 More than a third of Swedish population uses Spotify, and piracy has gone down there 25%. Have added 7 million users since September (when Facebook integration launched). We think that digital music is starting to light up. And it’s time for the next big step. Next up, introducing a great new partner — Jann Wenner cofounder of Rolling Stone has taken the stage. 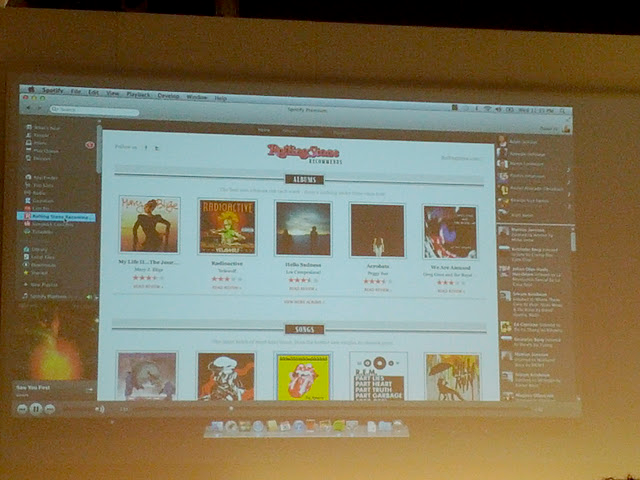 Rolling Stone is going to help with curation/discovery. Rolling Stone will be creating new playlists every day. “You need that help to discover stuff…”. Going to have fun playlists as well, like Mick Jagger’s ten favorite Reggae tracks. The new verison of Spotify has a section in the left side of the app called the App Finder. “The place where you find all the Spotify apps”. Now looking at the Rolling Stone app. Has playlists, albums, reviews, and other content that’s been curated by Rolling Stone. This is smart — the catalogs of these unlimited music streaming services can be overwhelming, and a lot of users will like having name-brand music experts pointing them in the right direction. The Last.fm app shows your recent Scrobbles, recommended artists, and other content you’d typically find at Last.fm’s website. Clicking on a song will begin playing it immediately. Spotify is also using the platform to build its own new features. You can now pin your favorite friends at the top of the right sidebar and see what they’ve recently listened to. “This is only the beginning, there will be things built here that we can’t even imagine today”. Update: Timing-wise, it sounds like users will be able to download a version of Spotify with a beta version of the App Platform today; it’ll be widely rolled out in the coming weeks. David Goodman (President, CBS Interactive Music Group)< Larry Goldberg (CEO, TuneWiki), Ian Hogarth (Founder and CEO of SOngkick), Bill Crandall (Head of Digital Content, RollingStone). Q: Are sites/apps going to be able to integrate Spotify functionality on their own sites, or will it be available exclusively through the app? A: It will be through the app. “We think this is the most beautiful experience”. Q: Can anyone use it or just these partners? A: This will be open for everyone, but we will approve the apps. Q: Will you be able to use this in mobile apps? A: First and foremost on the desktop, but if this is as successful as we hope, we’ll add it elsewhere (i.e. if it does well, it’ll come to mobile, and possibly other platforms). A: Partners can link off, right now there isn’t a rev share agreement. 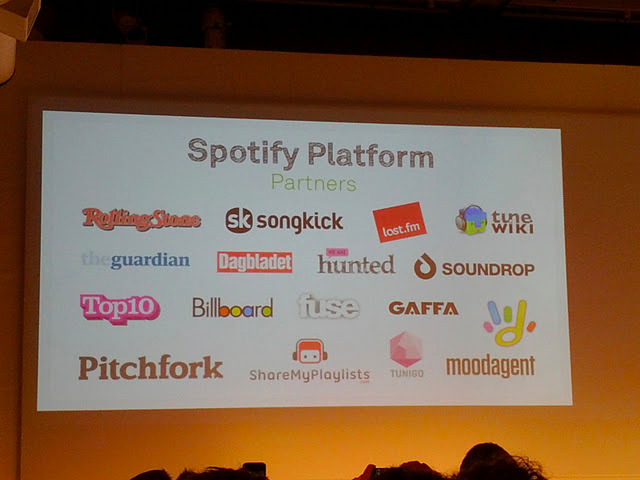 Sounds like these partners benefit from getting access to Spotify’s user base. Q: Talk about business model as your scale. A: We pay every time someone plays a song. We think that’s a great model. We don’t think we have onerous terms. Okay, seems that that does it for the news. The band fun has just taken the stage. They’re great, check them out. I’d recommend the songs Be Calm and The Gambler for starters.